Uncle Doc's Cards: Miami is First in Something! First team knocked out of the tournament that is! The Dime Box Braves finally closed the door on the Coot Veal and the Vealtones' Marlins this past weekend, securing their spot in the second round. 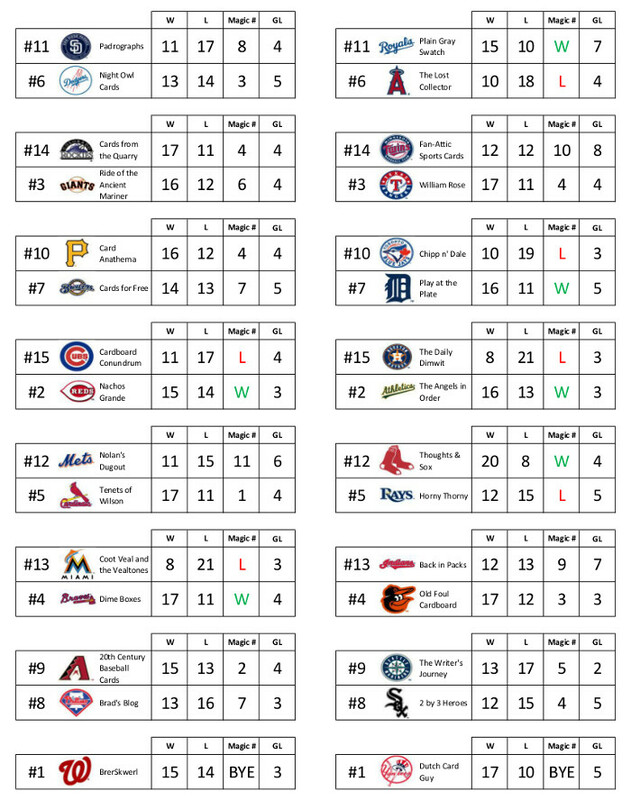 Several teams are poised to be eliminated in the next few days (Astros, Rays, Cubs, Phillies), and the second round bracket should be filled by weeks end. Be sure to check in each morning to see if your team makes it one step closer to the Championship! Marlins (Coot Veal and the Vealtones), Astros (The Daily Dimwit), Rays (Horny Thorny), Blue Jays (Chipp n' Dale), Angels (The Lost Collector) and Cubs (Cardboard Conundrum) have been eliminated.